Perfect for both indoor and outdoor activities, great gift for family and friends. • Comfortable and durable. Silicone band with the ultra thin design make it comfortable to wear and lead you to the edge of sport fashion. 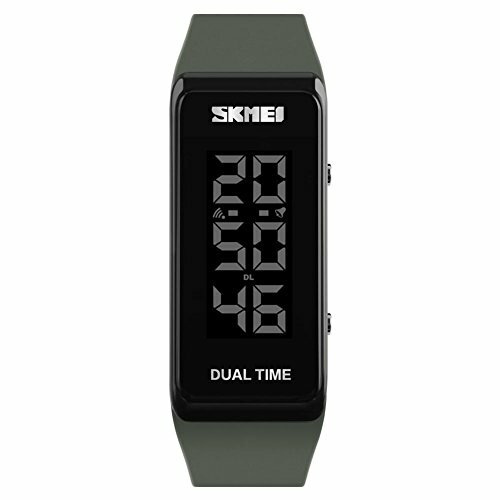 • STYLISH DESIGN: super easy to read, stop watch, military 12H / 24H time, and LED back light functions make it perfect for all kind of sports and daily use. a. Please DONOT Press Any Buttons Underwater. Also avoid the use in extreme hot or cold temperature. b. Clean the strap and glass cover by a soft clothing regularly is highly recommended. c. Too much water contact will shorten watch life. MULTIFUNCTION -- No EL backlight (not readable in darkness), 3 ATM waterproof, alarms, chime hourly, stopwatch, double time zones, 12/24H format, calendar. QUALITY CONTROLS -- Abrasion resistant PU band, imported Japan Movt and battery supports the accuracy rate less than 1 second per day and long lifetime. Stainless steel back cover doesn't easily rust in sweat or water. SPECIFICATION -- The band is removable. Fits for all people from old to young.